The North Carolina Jewish War Service Roster is composed of a large, 10-sheet roster entitled “War Service Record of North Carolina,” compiled and published on September 15, 1919, by the American Jewish Committee Office of War Records (or Office of War Statistics) in New York City, N.Y. The compiled roster documents the names, addresses and home towns, birth place of their parents, military branches, military units, and military enlistment or draft dates, for Jewish North Carolinians who served in the different branches of the U.S. military during World War I. The roster is not a complete list, but was compiled from available public records and solicited military service record requests of Jewish families by the American Jewish Committee. 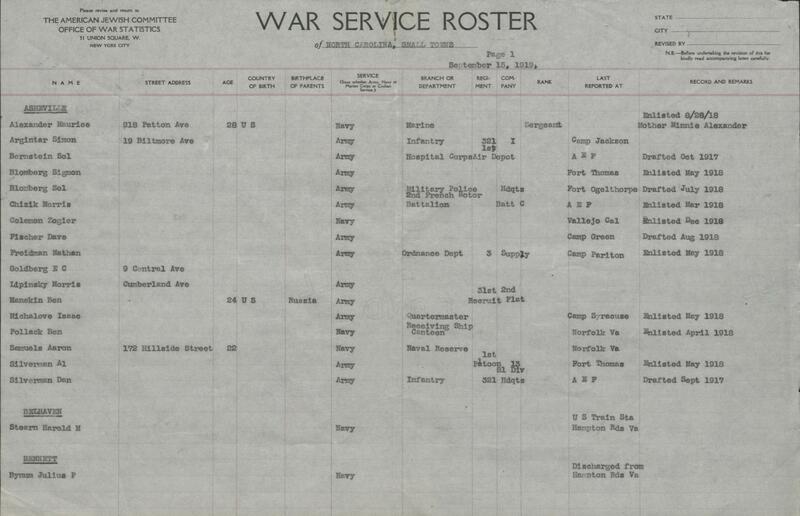 The roster is one of the only known original lists of Jewish North Carolinians serving in WWI available in the United States. The roster includes Jewish individuals serving in the war from the following North Carolina towns and cities, with the service individuals arranged alphabetically by town name. The list also includes individuals with North Carolina connections living in South Carolina: Asheville; Belhaven; Bennett; Charleston (S.C.); Charlotte (also a separate entry under “Sharlotte”); Concord; Connelly Springs; Dunn; Durham; Edenton; Fairmont; Farmington; Fayetteville; East Flat Rock; Francisco; Goldsboro; Greensboro; Greenville; Hickory; High Point; Kinston; Lancaster; Lenoir; Littleton; Matthews; Manteo (misspelled “Monteo”); Mill Branch; New Bern; Orangeburg (S.C.); Raleigh; Reidsville; Rockingham; Rocky Mount; Rutherwood (misspelled “Rutherwool”); Scotland Neck; South Mills; Tabor [City]; Wallace; Warsaw; Weldon; Wilmington; Wilson; Winston-Salem; and Zebulon. [The information on the American Jewish Committee Office of War Records was taken directly from the “Historical Note” of the Guide to the Records of the American Jewish Committee—Office of Jewish War Records (I-9), American Jewish Historical Society, at http://digifindingaids.cjh.org/?pID=109196]. The North Carolina Historical Commission (the precursor of the State Archives of North Carolina) recognized at the beginning of the United States’ involvement in World War I the importance for North Caroling to begin an effort of collecting materials which documented the role taken by North Carolina soldiers and civilians in the war. In cooperation with the North Carolina Council of Defense, a special history committee, called the “Historical Preservation” committee, was appointed by the Council of Defense. The Council of Defense Historical Preservation committee’s mission was to collect for permanent preservation the war records of the state of North Carolina. In 1919, the State Legislature formally approved the North Carolina Historical Commission’s war records collection efforts with the passage of Chapter 144 of the North Carolina Public Laws and Resolutions (specifically Sections 3 and 4) in 1919. The new law empowered the Historical Commission to appoint a collector of World War records, and provided money for the project’s support. Acting under authority of this law, the Historical Commission chose Mr. Robert B. House Collector of World War Records, and House entered upon his work June 19, 1919. One of House’s first tasks was to survey all possible sources of information concerning North Carolina in the World War to be found in the National Archives; in departments of the North Carolina government; and among the various county organizations and individuals of North Carolina. Dealing with federal non-profit organizations, House would solicit donations of records with a national scope that were used in North Carolina or by federal organizations that sponsored work in the state. One of these organizations was the American Jewish Committee of New York City, N.C. The U.S. Congress declared war on Germany on April 6, 1917. At the 11th Annual Meeting of the American Jewish Committee (AJC) on November 11, 1917—the first held after the declaration of war—members discussed “The matter of collecting complete and accurate statistics of Jews in the military and naval service of the United States…” and resolved that “...the Bureau of Statistics be directed to make every effort to secure data of this character.” The longstanding concern of Jewish leadership to document and publicize the patriotic contribution of Jews in military service to the United States had resulted in several studies of Jewish participation in past wars, including the American Revolution and the U.S. Civil War. The AJC’s project was intended to document Jewish participation in the U.S. armed forces contemporaneously with American participation in WWI. At the 12th Annual Meeting of the AJC on November 10, 1918, the Executive Committee of the AJC reported that during its meeting on December 9, 1917, it had directed the AJC’s Bureau of Statistics to undertake the task of the wartime data collection. The Committee authorized the Bureau of Statistics to open an office in Washington, D.C., to gather information directly from federal records, appointing Julian Leavitt as its director. With the war underway, government offices had little time to spare, and the Bureau’s Washington office closed in June of 1918, as it was unable to gain access to active military service records. Since military records did not contain religious affiliation, the Washington liaison had been undertaken only to gather service details of individuals. They created the Office of Jewish War Records, which was also called the Office of War Statistics. In order to identify Jews serving in the U.S. military, the Bureau turned to Jewish organizations for assistance. The Executive Committee’s report mentioned rabbis, national Jewish organizations, and the Jewish Welfare Board (JWB) (founded in 1917 to provide for the social and religious welfare of Jews serving in American armed force), as particularly helpful in supplying names of Jewish servicemen. The 12th Annual Report of the AJC—issued in 1919 for the year 1918—contains the First Report of the Office of Jewish War Records. The AJC also issued the reports separately as a pamphlet, The War Record of American Jews, First Report of the Office of War Records, January 1, 1919. The 13th Annual Report of the AJC contained the Second Report of the OJWR, dated October 19, 1919—less than a month before the Armistice was signed on November 11, 1919. The number of records of individuals collected had increased to 175,000, of which 150,000 were unduplicated. Quoting from the report: “... The present figures tend to strongly confirm the estimate…that the Jews of America have probably contributed, numerically, from thirty-three to fifty per cent more than their quota.” Data collection for the full report was to include community surveys, systematic collection of the war records of civilians who had served in war-related activities, and verification of service data by access to military records. The names and service data of individual Jewish servicemen were obtained from the following various sources: the Jewish Welfare Board; national Jewish organizations; local congregations, fraternal organizations, labor unions, and Zionist organizations; newspaper reports; information solicited from servicemen, their families, and relatives; and the U.S. War Department and local draft board lists. 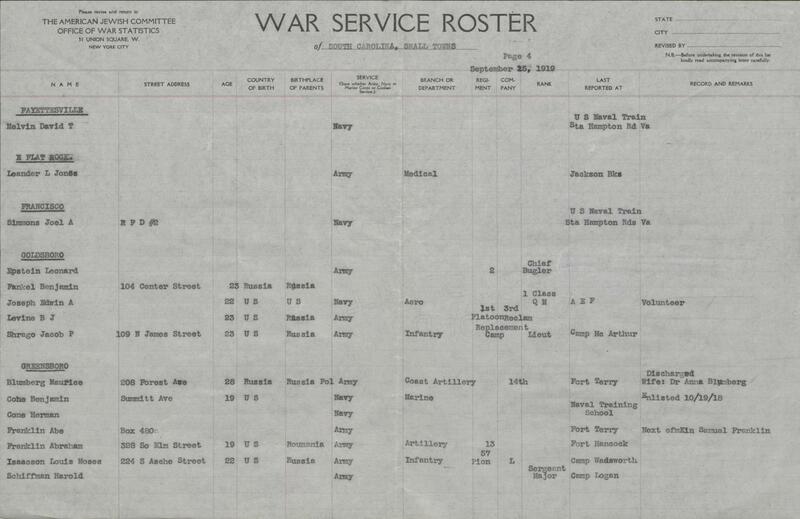 In addition to the collection of basic service data on Jews in the military from these sources, the OJWR sent out 16,000 detailed questionnaires to Jews whom it believed had served as Commissioned Officers, and to servicemen—both Officer and the Ranks—or their next of kin, whom it believed had been wounded or killed, and/or were cited for honors in WWI. As of the Second Report, 5000 replies had been received. The 14th Annual Report of the AJC contained the Third Report of the OJWR, dated November 14, 1920. The Third Report was brief, anticipating the publication of a Fourth and final report. The Third Report increased the total number of Jews who had served in WWI from 200,000 to 225,000. The Report also confirmed a 4 per cent Jewish participation in military service in comparison to the 3 per cent Jewish population of the U.S., and a volunteer rate of 20 per cent, “...unexcelled, as far as known, by any other element of the American population.” The OJWR estimated that approximately 2,800 Jews had died in service. No further report was ever made. The Office of Jewish War Records closed on July 31, 1921. To see the complete Jewish War Service Roster (WWI 93) online from the WWI Papers of the Military Collection at the State Archives of North Carolina in Raleigh, N.C., you can view the roster in the WWI collection of the North Carolina Digital Collections, a joint effort of the State Archives of North Carolina and the State Library of North Carolina.